With just one point credited from the four league matches played this season, United were firmly rooted to the foot of the table. Former Barnsley striker Kane Hemmings had given the visitors a first half lead but second half headers from Billy Sharp and James Wilson in front of the Kop, was enough to secure a victory. Chris Wilder had made two changes following last weekend's defeat at Millwall, defender Jake Wright was brought in, making his debut against his former club, and Matt Done was started, partnering Sharp in attack. O'Donnell and Clarke dropped to the bench, whilst John Fleck returned from injury on the bench also. With little more than a minute played, Basham found himself in the referee's book following a late sliding tackle on Dunkley, and whilst United battled hard, it was the visitors who saw most of the early momentum swing in their favour. Maguire tested Moore before the former Wednesday striker slid the ball into the side netting on 13 minutes after Hemmings crossed. Three minutes later Oxford grabbed the advantage. Wright had conceded a free-kick, who was shown a yellow card in the process. The free-kick was played short, allowing Sercombe time and space to drill a shot from 30 yards, Moore saved but HEMMINGS was poised and slotted home over the sprawling keeper. United responded well with some pressure but were unable to level the scores despite knocking the balls into the right areas. Wilson almost headed a Duffy free-kick at the far post, and Dunkley defended Freeman's shot well. As the first half clock ticked down, the pressure put on by the hosts did subside. When Wilson recycled Hussey's corner, Done fired over the bar, and when the latter was put through on goal by Scougall's through ball, Eastwood got down well to save. Despite chances, the visitors went in at half-time with the lead, sparking a rollicking from Wilder, with O'Connell replacing Hussey at the break. The early second half exchanges saw both sides create further chances in front of goal. Ruffels almost gifted United an equaliser, as he nearly headed into his own net from Duffy's cross but Eastwood reacted to well to prevent any embarrassment. At the other end, Moore saved well from Lundstram. Shortly after the hour mark, Done got the better of Dunkley, but fired his effort straight at Eastwood. It wouldn't take long until the Blades were level. Done was given plenty of space on the left to cross, and SHARP tussled with his marker to turn home at the far post, his celebration saw him fall over an advertising board in front of the Kop. United now had the momentum, and eight minutes later were ahead. Ruffels foul on Duffy had resulted in a free-kick on the right, and from his delivery WILSON'S looping header beat Eastwood. As the game wore on, Duffy saw a lot of possession and kept the U's at the back of field as they struggled to break away. Four minutes of injury time was added, but United professionally ran the clock down to their advantage. Fist pumps a plenty were handed out at the sound of the referee's full-time whistle. 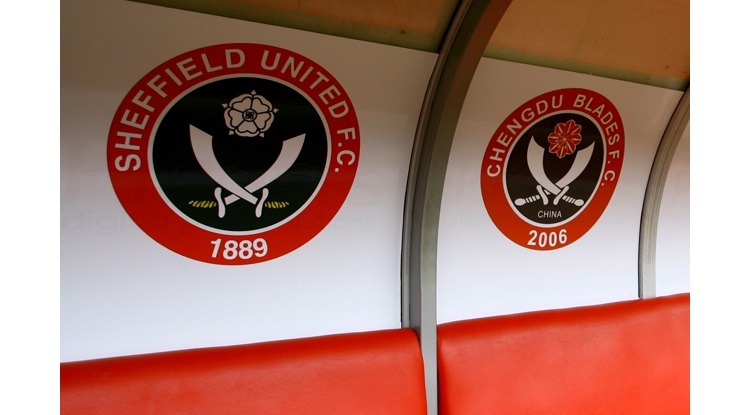 Sheffield United: Moore, Hussey (O'Connell 45), Basham, Scougall (Fleck 80), Sharp (Clarke 86), Done, Wright, Coutts, Freeman, Wilson, Duffy. Unused: Ramsdale, Calvert-Lewin, Whiteman, Chapman. Oxford United: Eastwood, Skarz (Martin 45), Lundstram, Sercombe, Thomas, Maguire, MacDonald (Rothwell 73), Ruffels, Hemmings (Taylor 67), Edwards, Dunkley. Unused: Crowley, Buchel, Roberts, Ledson.